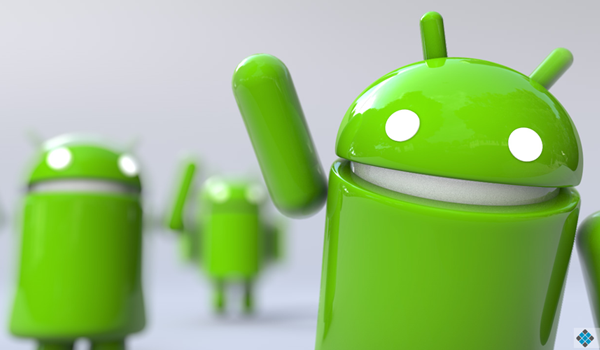 Are you new to the Android platform? Maybe you received a new device as part of a gift over the last month or so and now you’re ready to learn a bit more. Perhaps you just walked out of the store with a new handset only yesterday and you’re somewhat in the dark about everything it can do. Fear not, there’s plenty of awesome stuff awaiting you. We’re here to help you get started. Sure, your more seasoned Android users will likely look at this list and scoff. That’s because we tend to take for granted some of the things we can do with our favorite gadgets. For those who are only taking our first Android steps, well, sometimes we need a bit of help. What you will find below is a list of 20 things that every Android should know. We’re starting with some of the most basic stuff but think you’ll glean a few tidbits. Upon first setting up your device you will likely be asked to log in with an existing account or create a new one. But, first-time users may not know that once you’re logged in and set up you can always come back and add another. Be it another Gmail account, Google Apps, Hotmail, Yahoo, or something else, you can set those up, too. This, for many folks, is the way they manage both personal and work emails. Or multiple personal emails. Or… well, you get it. You can install apps from outside of the Google Play Store. In most cases, the Android phone or tablet you’ve purchased has an app icon on the home screen which directs you to the Google Play Store. For some devices, this is the only outlet pre-installed. In other cases, the wireless provider or handset maker may install their own respective destination. Take a look around and you may find something that leads you to more apps or games. It is also possible to install apps from other outside sources. Amazon, for instance, offers its own app store with hundreds of thousands of titles. Additionally, you can also install stuff from Getjar, SlideME, AppsLib, and others. Indeed, developers may also offer apps directly to consumers. Keep in mind that by going outside of the Google Play Store that you are essentially taking things into your own hands. Malware, crappy applications, and an undesirable user experience are risks you’ll take by doing so. This is not so much to scare you off but to notify you of potential hangups. Formerly known as the Android Market, the Google Play Store has evolved over time to include all sorts of stuff. In addition to the apps and games that make Android so great, you’ll also books, music, magazines, movies, and more. And, even though you’re using viewing it through your phone or tablet, that content is accessible online and through other devices. In other words, it’s possible to buy a movie through your phone and play it to your Chromecast. Or, perhaps you’d prefer to load it on a tablet. Maybe you’ve purchased some books or magazines through a mobile device and now you’d like to read them on the computer. Whatever, mix it up and have fun. That’s what is great about Google Play; there’s so much to choose from and so many ways to enjoy. For the last few years, and without fail, Amazon has been offering up a paid app or game for free. In most cases this changes every single day. In some instances, Amazon will even give away a full bundle of apps. In fact, depending on what sort of promotion is going on, you could scoop up dozens of dollars worth of stuff at no cost. As much as we may want to, sometimes it’s not possible to keep every app and game on our phone or tablet. Sometimes it’s a matter of storage capacity; other times it’s to help remove clutter. Whatever the reason, you might want to do a little bit of housekeeping. Go to your device’s Settings menu > Apps or Application manager (this may differ depending on your device). Touch the app you’d like to uninstall. Touch Uninstall. One of the great things about purchasing apps through Google Play and Amazon is that once you purchase it, the title is yours. So, feel free to remove stuff from your phone if that’s what you want or need to do. If, or when, you’re ready to put it back on, simply log into your account and app store. Naturally, free apps work the same way. One of the first things that savvier and longer-term Android users do with a new device is swap out the stock keyboard for something more personal. In some cases, the pre-loaded one happens to be the client we prefer. In others, however, we have a very particular setup and configuration that we enjoy. So, we head off to the Google Play Store for something else. There are a number of fantastic alternatives available to Android users, each of which has its own unique features and selling points. 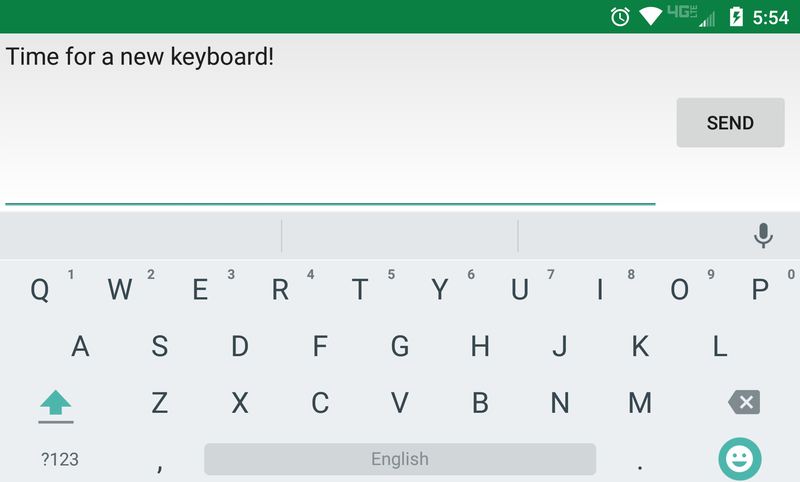 Some of our favorites include Swiftkey, Fleksy, Minuum, and the official Google Keyboard. Forget keyboards, that’s just the tip of the iceberg. Android, by its vary nature, is designed with flexibility in mind. This means that you can change pretty much every single aspect of the phone or software experience. Want a new phone dialer? There’s a ton of apps for that. Don’t like the icons or the default wallpapers? Oh, man, are you in luck! Head to the Google Play Store and you will no doubt find plenty of alternatives to the preloaded stuff that comes with your phone. The best part is, it’s really easy to go back to the way things were. Uninstall the app, try something new, have fun. Going more basic, you can change so much about your phone without going anywhere. Some users don’t even know that you can rearrange the home screen with different apps, shortcuts. and widgets. Have you seen those large clocks or weather details on the home screen of your friend’s Android? See that big, shiny bar with all of those sports scores ticking by? You’re probably admiring a widget. Built into Android since the 1.5 Cupcake release, widgets are a wonderful way of displaying lots of information on the main screen of your device. Sometimes we like them because they display very little information but in such a manner that it looks stunning. Your phone has a number of widgets pre-loaded as part of the application suite. Feel free to play with them, resizing and rearranging until you love the look. Don’t forget that you can head to various app stores to install widgets; some apps come with widgets included in the bundle. So you’re really digging that new Android smartphone but aren’t so keen on that lock screen. Maybe there’s just something about that swiping or PIN that you’re not to fond of. Most devices come with a number of pre-installed options, including Swipe, Pattern, PIN, and Password. Still not good enough for you? Take to the Google Play Store and you’ll find some incredibly gorgeous third-party options. Did you know that the Google Play Store is its own full-fledged website that lends itself well to browsing and exploring? It hasn’t always been the case; the former “Android Market” was nowhere near as polished as today’s experience. Nevertheless, you can head to play.google.com and hop around, checking out apps and games. The full website is a wonderful way to learn about apps, read reviews, check out videos, and more. While there, you can also do the same for books, movies, music, and other media. Yes, it’s also here you can purchase devices like a new phone, tablet, or wearable. Should you find something you’re interested in downloading or purchasing, you can push it directly to your mobile device. If there’s an app that you’d like to come back to another day, add it to a “wishlist”. Dig a little deeper and you’ll find the Play Store lets you manage your phones and tablets. Want to pull up a list of all the stuff you’ve installed on a particular model? That’s easy! The Google Play Store also allows for buying and redemption of gift cards, and purchases of instant credits. Spend a few weeks with Android and you’ll learn that a lot of apps are updated regularly. Maybe it’s to address bugs, maybe it’s to add new levels to a game. Whatever it is, you’ll find that your Google Play app will notify you of available software updates. While this is rather convenient on the surface, it can sometimes get monotonous. Why not let your phone do the work for you? 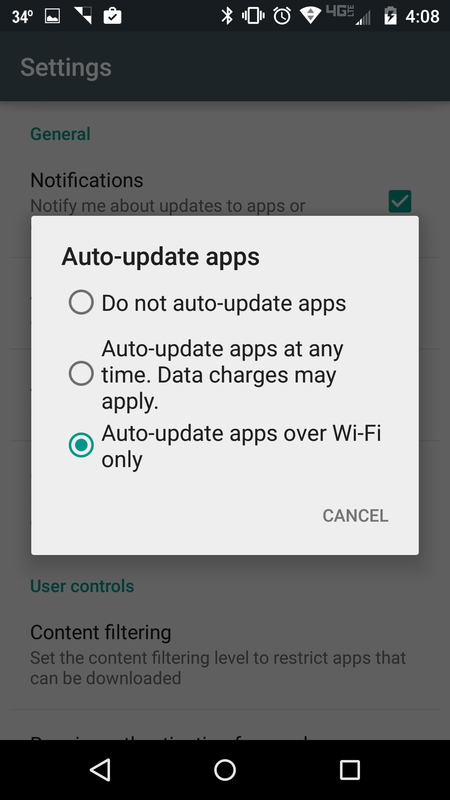 Indeed, you can enable your handset to automatically update apps. You can have it done in bulk or on a per-app basis; users can specify whether the device must be connected to WiFi to save on data connections. To toggle the setting, open the menu in Google Play Store and tap on Settings. There ought to be a spot that says Auto-update apps or something similar. From there you’ll be able to to make you selection. Additionally, you can look for the menu button when viewing a specific app in the Play Store. Found in the top right, it’s a simple check box that says whether or not you want that app updated without your having to do any work. Available from Android’s first release, sharing is one of those things that we tend to take for granted. Whether it’s a picture, a video, web link, or something else, there’s a chance you can share it somehow. Just took a picture and now you want to send to your friend’s email addresses? Easy. Want to upload to Facebook? Maybe you want back it up to Dropbox or Google Drive. 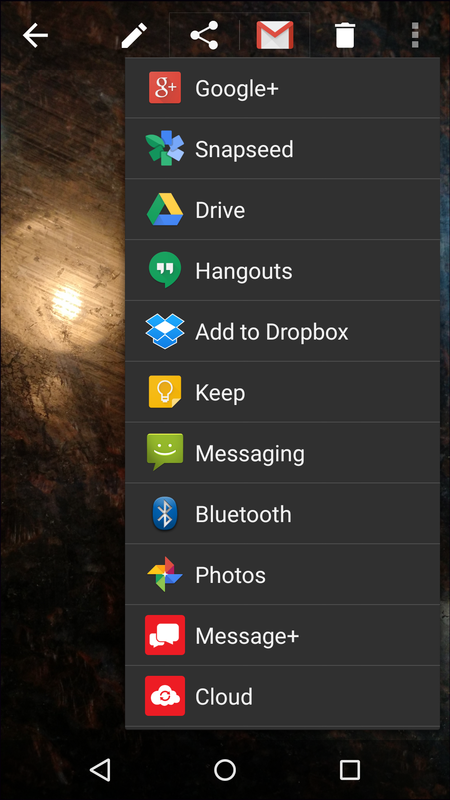 Android makes it very easy to share documents, links, media, and other items. In nearly every case you’ll find a simple “share” listed in menu options. In other cases it might say “send to” or something else. Once you start snapping a bunch of pictures or videos you’ll want to ensure they stick around for the long haul. In other words, you will need to make sure they’re not lost or deleted. Drop your phone in water? Perhaps you replace your handset with something else down the road. Backing things up to the cloud is a great, and often inexpensive way to hold on to your cherished moments. Sure, you can swap out microSD cards in many cases, but sometimes phones only offer internal storage. What to do then? Let’s make sure you still have access to that media! There are a number of options available to keep a copy of your files, some of which are pre-loaded on your device. Google, for instance, will back up your pictures and videos automatically through its Google+ service. That is, of course, provided you turn that option on. Dropbox, Google Drive, Box, and other players are more than happy to do the same. Just be sure to figure out what, if any, costs you could be looking at down the road. For those running Android 4.1 or later, which should be a large swath of you, there’s an incredibly useful tool waiting to be used. Built into Google is the ability to have all sorts of notifications sent to you. Be it weather updates, stocks, sports, or websites, Google can learn your habits and deliver a truly impressive “wow” experience. Do you have specific places you tend to visit on regular days? Google will learn your habits and begin to notify you of delays and ETA’s. Have some specific interests for television or find yourself searching certain things online? Let Google push that stuff to you! The great thing about Google Now is that it’s tied to your general Google login. So, stuff that you do online in the PC browser or on your phone will be counted. Order something from Amazon when you were at work? Watch how cool it is when you’re notified on your phone that it has shipped… and then you can track it. There are sorts of cool things you can do with Google Now. We’ve outlined a number of commands you can give the tool but the list grows all the time. And, thanks to recent advances, it works even tighter with a variety of Android apps. Find yourself with a bit of buyer’s remorse? That game that you thought was going to be awesome turned out to have bugs or not play nice with your phone? If you act quickly you can return the purchase for a refund. Google lets users refund their purchases through the Google Play Store for up to two hours. Although the early days of Android saw 24 hour time frames, Google did scale it back to 15 minutes for a few years. But, thankfully, it has since moved up to two hours. That should be plenty of time to find out whether that $5 game was truly worth the money. Do note that this does not for in-app purchases; those extra lives or boosts are non-refundable. You are welcome, however, to take it up with the developer directly. In the event you were looking for an app or game that you previously purchased but can’t recall the name or developer, it’s possible to find it. Let’s say you had a game on your phone last winter that you’d really like to install on your new tablet today. You paid for it once, it’s yours to own, regardless of how many devices or how long ago it was. Finding previous purchases isn’t all that hard and there’s a number of ways to go about it. In addition to apps and games you can also track in-app purchases, too. And, because it’s Google Play Store, you’ll also see all the movies, books, and other media purchased there. Worried that you’ll accidentally purchase an Android app? Or, perhaps, you’re more concerned that your son or daughter will once you let them play with the tablet? Put your mind at ease; it’s possible to password protect the Google Play store from within your phone. To be clear, this doesn’t restrict any access on your device; it only puts a password in front of the user. That password, by the way, is the same one you use for Gmail or your Google account. The user can choose from asking for a password every single purchase or once every 30 minutes. Also an option, disabling the password. In many cases the feature is now turned on by default; however, do know that you can always go back in and change things. For a lot of smartphone users, particularly those on shared plans, we’re restricted to using a set amount of data each month. And, while we’d like to think we’re in a plan that leaves us worry-free, that’s not always the case. Indeed, we have to keep an eye on just how much data we’re using. 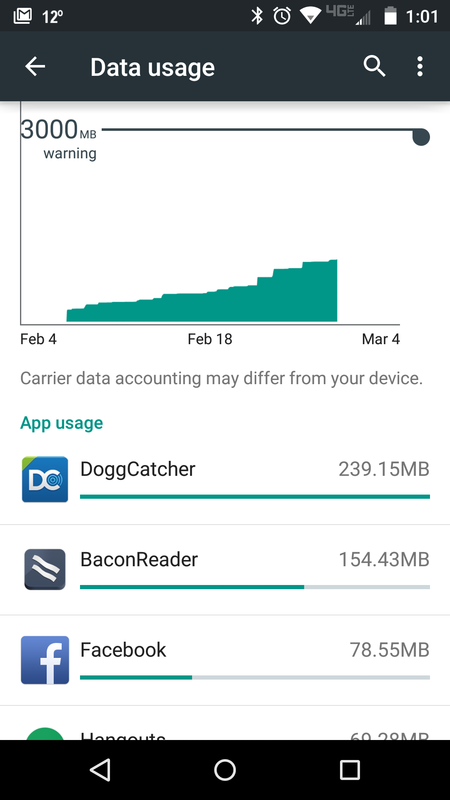 Introduced a few versions back, Android has a built-in feature that lets us see exactly what our data usage looks like. What’s more, we’re able to pare down and see which apps are chewing through things first. Here’s a hint: video services like Netflix, Hulu, WWE, and others will gobble data up. After that it’s typically your music streaming apps. This is not to say you won’t tear through data by using Facebook or Reddit apps, either. On your Android phone, navigate to Settings>Data Usage and you’ll have a nice set of options waiting for you. If you’d like, you can set a threshold to alert you when you reach a set amount. This way, if you are concerned about hitting that 3GB ceiling you can set a warning for say, 2GB or something. Have a child who likes to buy apps or games for their Android? 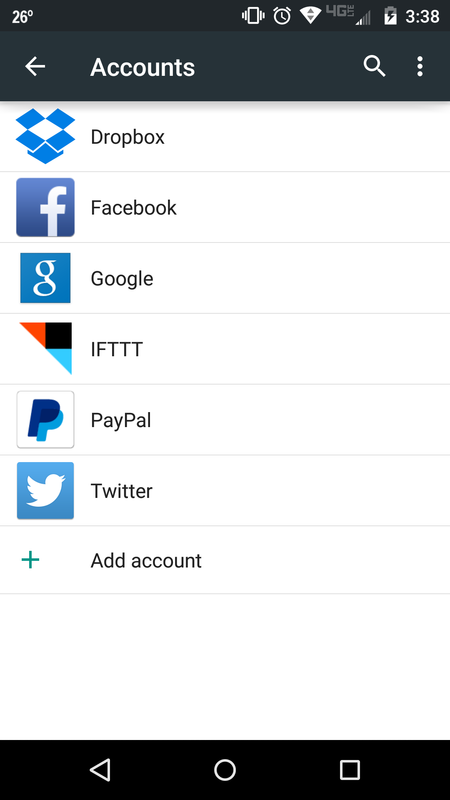 Why not set up a credit account within Google Play? 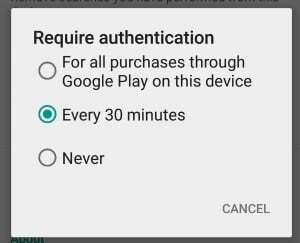 Tied to a Google account, it’s possible to purchase credit directly within Google Play either through the app or the website. You can also find Google Play cards at stores, gas stations, and other locations which can be added to an account. The nice thing about setting up the credits is that you’re essentially pre-paying for apps, games, and in-app content. Indeed, it also works for books, movies, music, and other media, too. Much like Apple does with iTunes, you can build up your own account or help out others. Not all countries have the same setup so be sure to do a little extra homework if you’re interested in credits. So you went out last night and somehow ended up at home without your beloved Android. It’s possible, but not guaranteed, that you might be able to locate it. 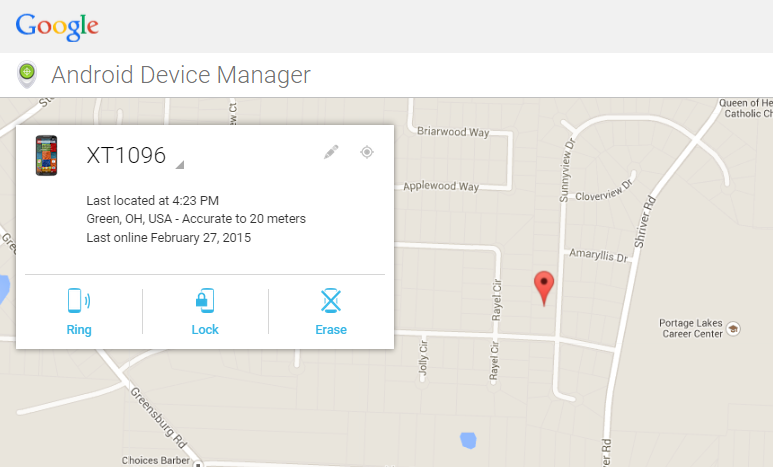 Google offers an Android Device Manager tool which can pinpoint where your Android was last known to be. Should you have simply misplaced the phone the resource might be able to jog your memory. If it’s actually stolen you can take some additional steps such as locking the device with a password or remotely erasing it.